"I went to Ed's clinic with a good mannered mare without any expectations - and I came out with a mare who reads my mind. Ed is really amazing. I'm impressed"
please contact us at customerservice@eddabney.com. To learn more about hosting a clinic, click here. *Private clinics are listed here to announce Ed's location on that day. If you live in the area of a private clinic and would like to schedule a lesson or training session with Ed while he is in your area he may be able to come to your facility the day before or the day after a private clinic. To schedule lessons or training sessions please call 770-314-9254 or email us at training@eddabney.com . Scroll down for more information on each clinic. 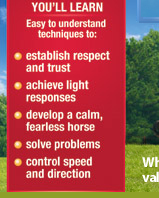 Essential exercises on the ground and mounted to achieve respect, trust and communication with your horse. Gaining high quality of control of speed and direction at all gaits through a blending of 16th century classical riding techniques and natural horsemanship. Under our coaching you will work with your young horse to teach him to accept the saddle and rider as well as fundamental exercises for control of speed and direction. designed for veterinarians, vet techs, vet students and other equine medical treatment providers to learn safe and natural methods for controlling and restraining horses without the use of sedatives and mechanical devices. 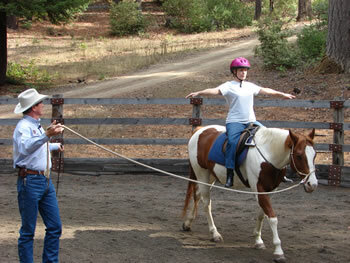 Even if participants are not planning on roping or performing ranch work, their riding skills and horsemanship will be improved in this clinic along with having lots of fun helping their horse learn new skills. This clinic can also include cow work such as tracking, driving, penning, sorting, roping and cutting. Ed is available to present specialized horsemanship demonstrations or lectures custom designed for your group to fit your location and time schedule. This can be done with or without a horse present. "What an amazing clinic with Ed Dabney - I've been to a lot of them with different clinicians through the years and this one definitely topped them all - I will definitely have him back next year. Thanks so much Ed for a super weekend and all you taught us. " "I just want to be sure to thank you for all your hard work and individual attention at the clinic. Obviously, it was the first time Tuff and I had ever done anything like this and it certainly was an eye-opener for me. You gave us some techniques that I can apply immediately in order to build a relationship with her and to education both of us! Please let us know if you would like to schedule a group or private training session with Ed during one of our Horsemanship Lesson Days. We schedule private and/or group lessons throughout the day to work on whatever issues the participants want to work on. You just let us know what you want to work on, how long you want the lesson to last, what time of day is best for you and if you want a private lesson or want to be put with a group who might be working on similar issues. Lesson fee is $150.00 per hour. These lessons are scheduled on a first come first serve basis.